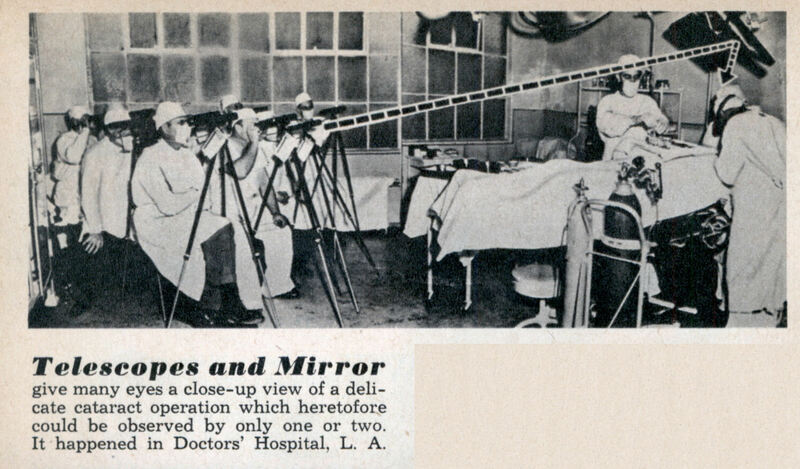 Telescopes and mirror give many eyes a close-up view of a delicate cataract operation which heretofore could be observed by only one or two. It happened in Doctors’ Hospital, L. A.
I can’t help but think that they wrestled for the best places, and that those in front (who obviously won) must be orthopedists. Who else would have the muscle to subdue a whole gang of ophthalmologists? But then again, why are they interested in a cataract operation? Hat tip to Modern Mechanix. You are currently reading The OR Before CCTV at The Sterile Eye.